Home /Nutrition/Chia Seed Benefits and Soy Secrets You Don’t Know! Soy and soy products have come under more and more close inspection in the news lately. If you've taken a look, and if you're a vegetarian or are investigating the vegetarian eating style, you've likely seen that the news isn't all good. Men, especially have cause for concern, due to the high plant-estrogen content of the soy bean and plant. Before reaching for another block of tofu, or taking a closer look at the vegetarian diet, you've got to read this! First of all, why is this especially a MEN'S issue? Everyone has a little bit of both types of hormones: Testosterone and Estrogen. They play important roles in the body's many functions. Men have more testosterone than estrogen and they don't need any more than the body already produces. Declining testosterone production in older age men causes health problems, as the testosterone/estrogen balance is then upset. Testosterone levels in boys are also important for proper development and bone health. Adding in extra estrogen to the mix isn't a good idea at any stage. So what's the problem with soy? It has high levels of 'plant estrogens . Plant estrogens are hormones the plant uses for its daily function. They're not the same as the ones found in humans, and if consumed, are 1,000 times LESS effective as human hormones. They are sometimes called phytoestrogens or lignans. But as a vegetarian, or anyone trying to adopt a healthy eating pattern, soy and soy products play a big role. Don't want nasty bovine hormones? Drink soy milk. Don't want to hurt animals by eating meat? Get protein from tofu blocks/ tofu dogs/to-furkey and countless other sources of Soy products. It may be less effective than human estrogen, but all those little bits add up when you're using soy and other phytoestogen rich plants as your protein source. These may be ok for women, especially anyone having menopause, but males don't need any extra estrogen. You might see a lot of studies done in the news saying things like 'too much soy reduces sperm count and 'over-eating of soy products leads to earlier memory-loss in men in Indonesia (Indonesia consumes a lot of soy as part of the traditional diet) While the FDA hasn't ruled on anything yet, this 'Bad Buzz is enough to scare some people away, and make others think twice. Unfortunately, this fact (and the fact that not everyone is going to like tofu, no matter who they are) scares people away from even trying the vegetarian diet. This no longer has to be the case! A recent discovery makes it much easier (and more delicious) to get the protein you need, without ANY soy or soy-based product. This seed is unique among seeds for many reasons, all of which are beneficial to you! First off, by weight, the chia seed is 23% complete protein. Complete protein is difficult to come by in the plant world, and most people get their daily amount from animal meat. Vegetarians routinely mix together incomplete protein food sources in order to meet healthy diet needs. The Chia seed's protein level makes it a valuable dietary addition for vegetarians. This tiny seed has other wonderful benefits that can especially be taken advantage of by men. They don't have plant estrogens to mess with the hormone balance that keeps you healthy. They don't require you to learn how to cook with tofu (and make it taste good'a real feat!) They don't require lots of preparation time or know-how in the kitchen. You don't have to change your eating habits. Basically, if you have a measuring spoon or scoop, you can use chia'whether you're a vegetarian or not! Chia has no flavor of its own. You're not fighting to cover up a taste you don't want. Instead, the seeds distribute the flavor of food or beverages you add them to. A food with totally customizable flavor is a food that's totally easy to use. Sweet or savory, in a recipe or just sprinkled on top, Chia seeds go to work distributing the flavor right away. There are so many ways to use it. Tofu claims to be versatile, but can you use it to cut out half the fat of a delicious brownie and have it taste exactly the same? No way! But Chia Seeds can. Chia Gel can replace up to half of the butter or oil in any recipe without altering the flavor or the cooking method. Another thing you can't do with tofu, is to sprinkle it over any food you already like to eat, to get your daily recommended amount. Any food that is moist enough to prevent the seeds from bouncing off the surface can be used. This includes pizza, yogurt, ice cream, soup, sandwiches, cereal and any drink. The flavorless seeds won't interrupt your eating enjoyment. Chia Seeds are loaded with bonus benefits. Want to feel full at meal time without eating as much food? The fiber and gelling action of the seed keeps you feeling full longer, and replaces calories you'd normally eat with water. Want better regularity? 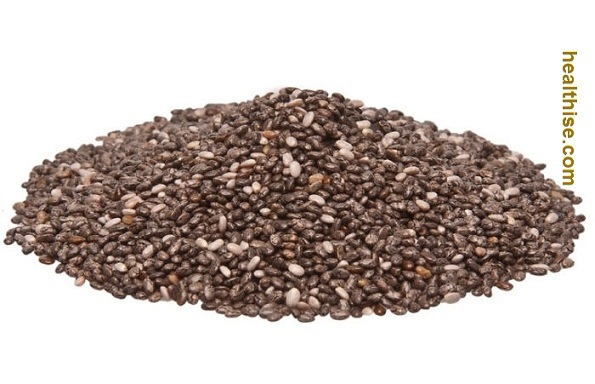 Chia is packed with soluble and insoluble fiber. Insoluble fiber acts as a 'sweeper' in the intestine, keeping food moving along. Soluble fiber irrigates the bowels making digestion easier so the intestines don't have to work as hard to move food. Enough fiber in your diet also helps reduce the risk of colon cancer. Every seed is packed with nutrition: a full range of B vitamins, more calcium by weight than milk, healthy omega-3 oils, anti-oxidants, and important trace-minerals such as boron. There's no need to 'fear the tofu if you're looking to make the healthy choice of a vegetarian diet. If you are already a vegetarian, all the anti-soy hype in the news won't bother you, when you have Chia Seeds in the house. Whatever conclusion the scientific studies come to, with regards to plant-estrogens, you'll know you're safe with chia seeds. Don't wait another day to try this nutrition revolution!